Black plastic trailer cover cleat. Used to secure the elastic (Shock Cord) which holds down the transit cover on trailer tents and luggage trailers. Replacement lock and 2 keys to fit the swing out kitchen or rear door on most Camp-let trailer tents prior to 2012. Replacement steel R pin used to set the height of the adjustable bed leg on most Camp-let trailer tents. Replacement adjustable bed leg for Camp-let trailer tents with body. Available to fit the front or rear of the trailer. Webbing strap for the back rest support frame of the bench seat on the left hand bed of Camp-let trailer tents. Replacement plastic trim piece for front right hand corner of Camp-let trailer tents. Lid side piece that fits to all Camp-let models. Replacement plastic trim piece for front right hand corner of Camp-let trailer tents. Base side piece that fits to all Camp-let models. Replacement dust caps for luggage frame on Camp-let trailer tents. Plugs hole in luggage rack where bed legs are fitted prior to pitching the Camp-let. Telescopic pole with 26 mm C clip. Attaches to the awning front pole on Camp-let trailer tents to give added support to the awning in bad weather. Replacement key pole or awning connecting bar for lost or bent bars on Camp-let trailer tents with apex front roof pole. Male wingnut replacement for the front telescopic awning pole on Camp-let trailer tents made before 2007. Polework repair section for anyone who has forgotten to fold out the kitchen pole when erecting their Camp-let. Fits all Camp-let models. Replacement protective hinge cover for Camp-let trailer tents. Covers the main trailer hinge between the trailer lid and base and fits both piano hinge and gas lift trailers. Replacement screw closure handle to fit the swing out kitchen or rear door on most Camp-let trailer tents prior to 2012. 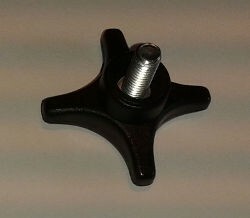 Pack includes plastic hand wheel with 55mm threaded screw, washers, spring and securing nut. Telescopic roof support pole fits between the central and front awning roof poles on Camp-let trailer tents. Easily fitted once your Camp-let is pitched this version fits all Camp-lets with flat (i.e. not apex) roofs. Stainless steel wire cage to fit over the rear trailer lights on the Camp-let Savanne trailer tents made from 2004 to 2007. Protective cage has 4 screw points to fix to the trailer body and covers the lens preventing damage from impacts.